Glacier Girl is a Lockheed P-38F-1-LO Lightning World War II fighter plane, 41-7630, c/n 222-5757, that was restored to flying condition after being buried beneath the Greenland Ice Sheet for over 50 years. On 15 July 1942, due to poor weather and limited visibility, six P-38 fighters of 94th Fighter Squadron/1st FG and two B-17 bombers of a bombardment squadron were forced to return to Greenland en route to the British Isles during Operation Bolero. The aircraft were forced to make emergency landings on the ice field. All the crew members were subsequently rescued. However, Glacier Girl, along with the unit's five other fighters and the two B-17s, were eventually buried under 268 feet of snow and ice that had built up over the ensuing decades. 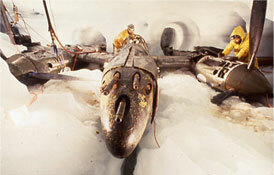 Fifty years later, in 1992, the plane was brought to the surface by members of the Greenland Expedition Society after years of searching and excavation. 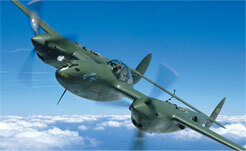 The aircraft was eventually transported to Middlesboro, Kentucky, where it was restored to flying condition. The Lightning returned to the air in October 2002. On June 22, 2007, Glacier Girl departed Teterboro Airport, New Jersey in an attempt to fly across the Atlantic Ocean to Duxford, England to complete the flight it had begun sixty-five years earlier. On 28 June, however, a coolant leak in the #2 (right) engine grounded the plane in Goose Bay, Labrador. 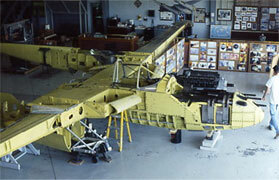 On July 22, 2007, repairs were completed in Labrador, which included installation of two re-manufactured Allison engines. Glacier Girl returned to the U.S. on July 23, and can now be seen at air shows in the USA. Formerly owned by J. Roy Shoffner of Middlesboro, Kentucky, in 2003, 'Glacier Girl' was awarded the Neil A. Armstrong Aviation Heritage Trophy, becoming Grand Champion by an overwhelming vote.